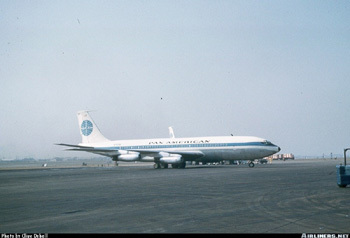 Pan American, N709PA, a Boeing 707-121, operating as Flight 214, departed Baltimore, Maryland, for Philadelphia, Pennsylvania at 8:24 p.m. Eastern Standard Time (EST) on December 8, 1963. The aircraft with 73 passengers and a crew of eight was on an Instrument Flight Rules (IFR) clearance. The airplane reported over the New Castle, Delaware VOR at 8:42 p.m., and was instructed to hold at 5,000 feet, west of the VOR. The airplane was struck by lightning while holding and was immediately observed to be on fire. A large portion of the left wing separated in flight. Flight 214 crashed two miles east of Elkton, Maryland, at 8:59 p.m. The aircraft was destroyed in the crash, and all aboard were killed.